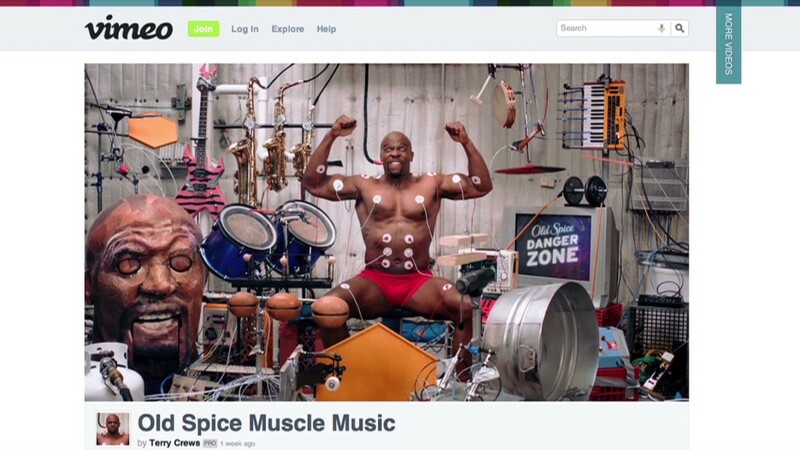 Old Spice has scored yet another viral hit, this time with an interactive video that lets you command Terry Crews' impressive brawn and strike up some "muscle music." The ad, which features the fiercely built former NFL player, is the latest in Old Spice's campaign of humorous Web shorts. Like previous ones, the ad is a big success -- after two days, it had racked up 2 million views online. You can see it below. It's not more of the same, though: The ad doubles as a music making game, providing a new level of interaction that could provide a glimpse into the future of advertising. "You allow people to be a part of the creative process. It becomes more than just, 'Hey look at this video,'" said Jason Bagley, a creative director who worked on the project at Wieden + Kennedy. It's the same ad agency that created Old Spice's string of popular 2010 commercials featuring Isaiah Mustafa, a former NFL practice squad wide receiver. The edgy style seems to work. The first leg of the 2010 campaign helped Proctor & Gamble recast its Old Spice brand and propel it ahead of competitors like Unilever's Axe. Old Spice body wash sales jumped 107% after the campaign got going, according to Nielsen. Since then, Old Spice has released dozens of videos with more than 250 million views -- on YouTube alone. This time, the agency teamed up with small companies to achieve what its creative directors initially thought impossible. To create the visual effects of playing fire-spewing saxophones, assorted drums and more, they turned to The Mill in Los Angeles. The ad agency also partnered with video-sharing website Vimeo, which hosts some of the most creative and artful films online. The 1:16 short is the latest featuring Crews. He controls more than a dozen instruments by flexing forearms, biceps, deltoids, abs and quads. And there's shouting too. But it gets really fun once the video ends. Viewers can use their keyboard to control Crews' body -- and the instruments. And they can record it and share their sounds. There were technical challenges, though. More than 150 animated elements were created, and optimizing the speed at which they could work together proved especially difficult. The teams also had to overcome the challenge of creating a single video player that would double as an interactive player and wouldn't force viewers to click elsewhere. Bagley said he recognizes the project as a major step forward for the future of advertising, which is constantly attempting new ways to draw in the public. As for how the video was made, Bagley's keeping quiet. He said Crews was actually flexing and the electrodes were real, but he wouldn't say whether Crews' muscles played the instruments -- highly unlikely -- or the other way around.